The Library’s Colbeck collection of 19th century literature has inspired a joint event with UBC’s School of Music and the Department of English. 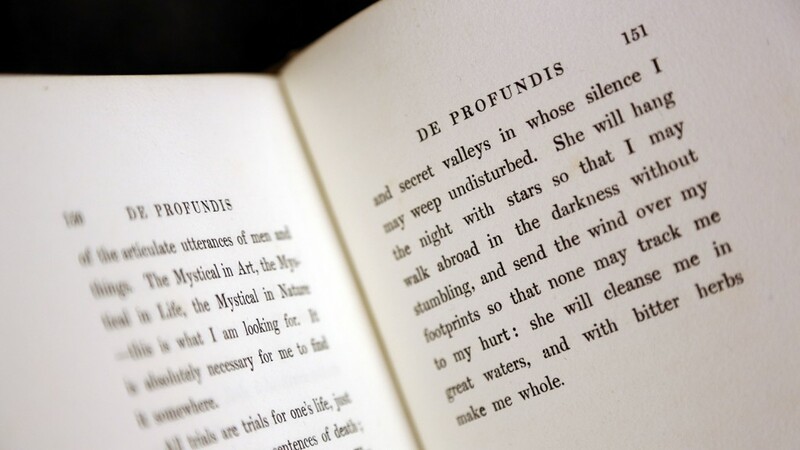 The three units present an evening performance called De Profundis: Speaking of Music, featuring a panel discussion about the words of Oscar Wilde, the music of Frederic Rzewski and a fusion of the two. Rzewski’s De Profundis has been described as a melodramatic oratio, in which the pianist recites text consisting of portions of Oscar Wilde’s letter to Lord Alfred Douglas, written during the author’s imprisonment. While imprisoned, Wilde served a two-year sentence of hard labour in solitary confinement for his relationship with Douglas. Panelists are Dr. Terence Dawson and Dr. David Metzer (School of Music) with Dr. Gregory Mackie (English Department), and the evening concludes with a concert presentation of Rzewski’s De Profundis for speaking pianists performed by Dawson. The performance features eight sections of the rhythmically notated recitation, preceded by eight preludes, with the pianist directed to perform simultaneously as speaker, singer, whistler and percussionist.